Learning Garden 10: How Does Your Garden Grow? 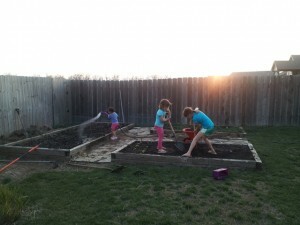 Gardening makes me happy, especially when I am gardening with my three girls, as seen in the picture below. The benefits of a garden are undeniable. As we work with the soil to grow our vegetables, we learn about soil fertility (science). When we plant the seed, we read the label directions on the seed packet (English) and learn the depth at which we need to plant the seed (math). We look at the sun that provides the heat to warm the soil and we add water that provides the moisture for the seed to germinate (botany). Then we wait (delayed gratification) for the seed to root and pull up nutrients from the soil (science) and grow into a plant that produces a vegetable (food production). We grab our harvest basket and collect the vegetables that we have grown (teamwork). We sit down at the table (sense of belonging) to enjoy a meal (nutrition) grown from our hard work and care (nurturing). I am excited that our schoolchildren have the opportunity to learn these subjects, skills, and attributes from our new learning garden. University research supports school learning gardens and our desire to bring students out of the traditional classroom and into a natural environment, but you don’t necessarily need a research study to tell you that. Just spend about twenty minutes in a garden with a curious second grader (or a whole classroom of second graders, if you are brave)! When planning our outdoor classroom, we knew that a learning garden would benefit our students. However, in order to get funding and approval we had to validate its benefits. Our teachers, staff, school board, and parents needed to know that building a learning garden was a worthy effort that would enhance and improve the overall education of our students. There is a select group of universities who has contributed their time to analyzing and interpreting the effects of learning gardens. Research that I most frequently site was compiled by Cornell University. They summarize research findings in six benefit areas of garden-based learning. To get more details, visit the Cornell University page at Cornell Garden Based Learning. Reading through the benefits listed on Cornell’s site just reiterates my enthusiasm and passion for learning gardens. Who wouldn’t want an educational tool that gets kids to eat fruits and vegetables, improve science scores, enhances moral education, increases appreciation for how food is grown and produced, and develop patience, teamwork and more? As I said, the benefits are undeniable! I love gardening with my three girls in our backyard, and I am excited to see our students’ garden in the school’s backyard!